So, it’s that time of year again. Tisha B’av. This is the national day of mourning for the Jewish people. We commemorate the destruction of the Beis Hamikdash/Jewish Temple that was destroyed not once but twice over the course of history. The first temple was destroyed by the Babylonians and the second temple was destroyed by the Romans. In observance of this we engage in intense mourning for about 24 hours once a year. Not only do we abstain from eating, drinking, showering etc. – we sit on the floor and wail from the Book of Lamentations. The question I would ask is, how can we mourn for something that is gone if we never personally experienced it to begin with? The Temple seems so distant in the past and we don’t even know who the Babylonians are at this point. How does one find meaning in this day? Are we just going through the motions with our practices of mourning? It occurred to me that we are not only sad about the absence of a building in Jerusalem that no longer exists. No matter how devastating it is that we no longer have our central house of worship that just reflects the state that we find ourselves in. That is the state of Hester Panim/ G-d’s Concealed Face. The basic understanding of this idea is that although God is very much present in our lives, “His Face” remains concealed. That translates into a perceived lack of justice in the world. That is why we struggle with so much pain, suffering and tragedy. If only we were able to experience the Godly radiance in our lives, we would see so much more blessing and have much more clarity. Alas, His Face is concealed. The devastating consequences cannot be overstated. From terrorism that is growing to tyranny that is flourishing, we suffer every day and many times during the day from being in this state of Hester Panim. Our holidays are not just events of commemoration, but rather occasions to reflect, relive and amplify the root cause of the day. 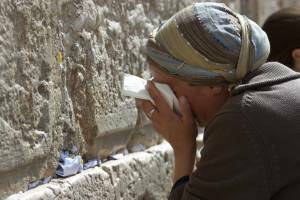 As we sit on the floor on Tisha B’av and hear the solemn Book of Lamentations being read, let us remember that beyond mourning our shattered past, we also mourn for our current state of affairs. I think about the isolation of the one and only Jewish state and how that state is the only country in the world that faces calls for its destruction. I think about how “Zion” has become a dirty word in most world capitals and citadels of culture in the world. I think about the only country in the world that does not have a right to name its own capital. I think about all the people who have perished in terror attacks that have been unleashed by the forces that champion hate. I think about all the people suffering from terminal illnesses. I think about many young widows and orphans that struggle to make it through the day. I think about all the people that are undergoing financial distress and struggle to pay their monthly rent and put some groceries in their cupboard. I think about all the heroic parents who despite their best intentions and rock solid values have their children grow up and reject the values that were most dear to them. I think about all this and understand that the root cause of all these most unfortunate and tragic circumstances is that we live in an era of Hester Panim. I hope and pray that we will one day break out of this unfortunate state. I hope and pray that we hear that sound of the shofar that will usher in an era of not only world peace and goodness but most importantly an era in which God’s Face is not concealed but where we feel His warmth and love. Until then I will get on the floor and mourn and perhaps even shed a tear about the state of Hester Panim that seems to be intensifying at the moment. I hope you have a meaningful Tisha B’av.